Even though this villa has four bedrooms, it seems super-sized! Every room is massive, spacious, and airy. This beachfront property is surrounded by thick gardens, which maximizes privacy, and there’s several places to kick back and relax. There’s a quiet and secluded gazebo, loungers with umbrellas, a courtyard filled with palm trees, and a library/study. The whole family can lounge on the massive veranda, or spread out inside the home in any of the generously sized rooms. Even better, Calmaro is only a few steps from the sea, so you’ll feel like you have your very own slice of paradise. Calmaro is a beachfront property between Sandy Lane and Sunset Crest with mature gardens and spacious, tropical interiors. 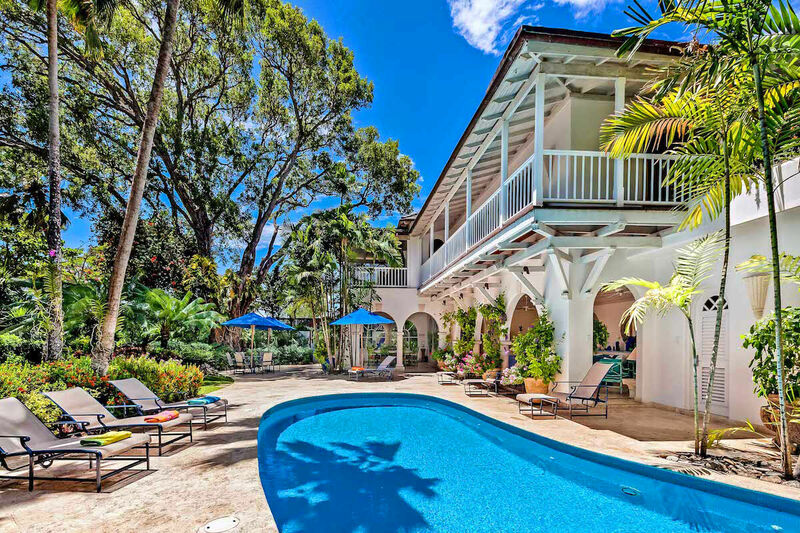 Two stories of beachfront living and a prime St. James location make this villa a perfect choice for a family vacation. Palm trees and loungers surround the curved pool, and there are gazebos and verandas throughout the property. There’s a BBQ and sound system for al fresco feasts, and dense gardens border the home to add privacy. There’s an oversized lounging terrace with tropical design, and a dining gazebo with charming ocean views. The gourmet kitchen has an open floor plan and chic decor, with top of the line appliances and modern cookware. A coffee machine, dishwasher, wine fridge, and ice maker are just a few of the kitchen amenities. Find peace and quiet in the library, or take a meditative stroll through the gardens. Each of the villa’s four bedrooms have an ensuite bathroom, and all but one opens to a private balcony. Two bedrooms have a king-sized bed, one has two twins that can be converted into a king, and the fourth has a queen-sized bed. The bathrooms have walk-in showers and modern finishes. There are tropical murals and designs painted throughout the home, and views from every room. Calmaro is a short drive from several restaurants, and near Limegrove Lifestyle Centre and Cinemas. Take a short walk to Sandy Lane Beach or a five minute drive to Folkestone Marine Park and Museum for snorkeling. Book a tee time at Royal Westmoreland’s world-renowned course, or explore shopping and dining in Bridgetown.